If a message or vehicle pictogram is displayed, press button on the windscreen wiper level or the button on the multifunction steering wheel . You may need to press the button several times. 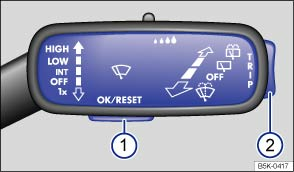 Operation using the windscreen wiper lever: to display the selection menu or to return to the selection menu from another menu or information display, press and hold the rocker switch until the selection menu is displayed. To browse through the selection menu, press the rocker switch up or down. Operation using the multifunction steering wheel: to display and browse through the selection menu, press or . 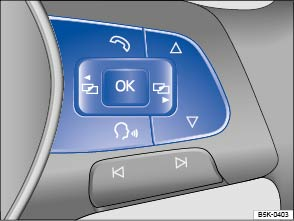 To open the menu or information display shown in the selection menu, press on the windscreen wiper lever, press the button on the multifunction steering wheel , or wait until the menu or information display opens automatically after a few seconds. In the displayed menu, press the rocker switch on the windscreen wiper lever up or down, or press the arrow buttons or on the multifunction steering wheel until the required menu option is selected. A frame appears around the selected option. Press button on the windscreen wiper lever or press the button on the multifunction steering wheel to make the required change. A tick indicates that the particular system or function is active. Using the menu: in the menu, select the Back menu option to leave the menu. Using the multifunction steering wheel: press the or button .